Facebook is adding a feature called ‘Safety Check‘ to help its users broadcast their health and whereabouts during natural disasters. The tool will be available on the Web, iOS, Android and feature phones. When the user is deemed inside an affected area, Facebook will send an alert or push notification asking whether they’re okay. 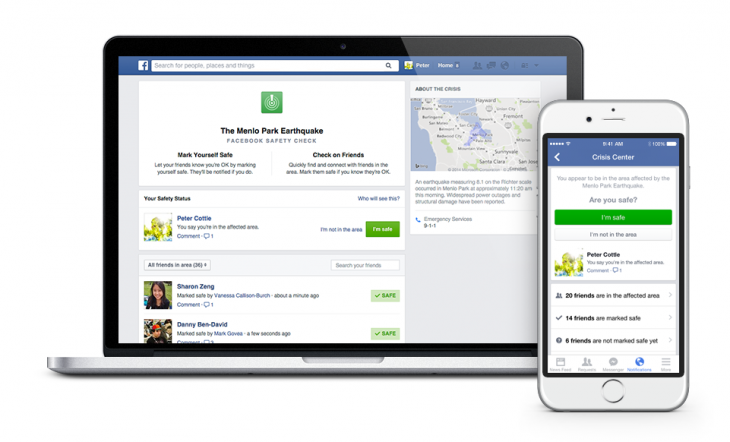 From the Safety Check dashboard, users can then see which of their friends are in the same area and the number that have already marked themselves as safe on Facebook. Once the user has confirmed they’re out of harm’s way, a Safety Check notification will appear in other people’s feeds. Users can review the number of people in their network marked as ‘safe’ and also tick off friends and family who may not have access to Facebook, the internet or a mobile phone. Hopefully, you’ll never have to use such a tool. But natural disasters aren’t disappearing any time soon and Safety Check, especially with Facebook’s user base, could prove effective an effective communications tool during such events – and give you peace of mind about the safety of loved ones.